The cottage is ideal for single travellers, couples or friends who are looking for a central location in Arrowtown. From the cottage you can walk into Arrowtown to shop, enjoy lunch and dinner or head out into the hills for hike or bike ride. The first bedroom has a queen bed and shower room with washing machine and dryer. The second bedroom in the cottage is large, with ensuite shower room and kitchenette. For 1 or 2 guests who only require the first bedroom, we can close off the second bedroom and it is not used. This ensures the rate of $155 per night (please confirm if you only require one bedroom, and let me know if you require both bedrooms. It is $170 per night if you require both bedrooms for 2 people). From the front door of the cottage you can walk into town in less than a minute, walk to the river and enjoy hiking or biking in 2 minutes, and head out into the hills to walk for an hour, half a day or a full day. Take advantage of the Queenstown Trail which runs just past the property. This trail offers over 100kms of biking trails - you can set out in a different direction each day! Arrowtown is a town of 4 seasons. Enjoy spring with blossoming trees, lazy summer days by the river or Lake Hayes, or make the most of the long days and hike or bike to explore the area. Autumn is a magical time, with trees changing to red, orange and gold. In winter Arrowtown is a fantastic place to base yourself for a skiing or snow boarding holiday, with 3 skifields within easy driving distance. Please note that the price quoted for 2 people is for one bedroom only. If you require both bedrooms for 2 people, the price per night is $170. No tents in the garden. The property may not be suitable for younger children but is suitable for older children - please enquire. We are happy to clean the cottage after your stay, but ask that you leave the cottage tidy when you leave, with all washing up done and put away. Walk from the front door into the hills or along the river for walks ranging from 1 hour to all day. Bike from the front door onto the Queenstown Trail and experience over 100kms of biking trails. Walk into town (just a minute away) to enjoy one of the many excellent cafe and restaurants, the museum and shopping. There is a private bathroom for the bedroom (with queen bed) at the front of the property. This rooms also has a washing machine and dryer. The second bathroom is an ensuite shower room for the second bedroom (with queen and single bed). You will keep cosy and warm with our electric radiators and fan heaters if you need a bit of extra heat. The cottage is modern and has double glazing so you will be warm in winter. All beds fully made up with sheets and duvets and there spare blankets if needed. The cottage also has a clothes rack for clothes that can't go in the dryer. Bathtowels, facecloths, handtowels, bathmats, tea towels all provided. Tea, coffee, sugar, salt, pepper, oil plus some other things! The cottage is based in the centre of historic Arrowtown. Visit the local museum, old gaol and Chinese village for more information about the town's history. Arrowtown is centrally located in the Southern Lakes region, famous for many adventure activities and tourist attractions. It is a great place for families with many free activities including exploring the Arrow River and hills around, checking out the Chinese village, visiting Lake Hayes for a swim or hike or exploring Arrowtown, Queenstown or Wanaka. Very close to township. Also to walking and biking trails. Property very clean and tidy. The Poplars is a gorgeous cottage at the end of Arrowtown's main street, so you don't have far to go for shopping and cafes. It is clean and tidy and pleasant to live in. The garden has lovely shrubs and roses. It is just a few steps down to where the the river is so you can enjoy morning and evening strolls. 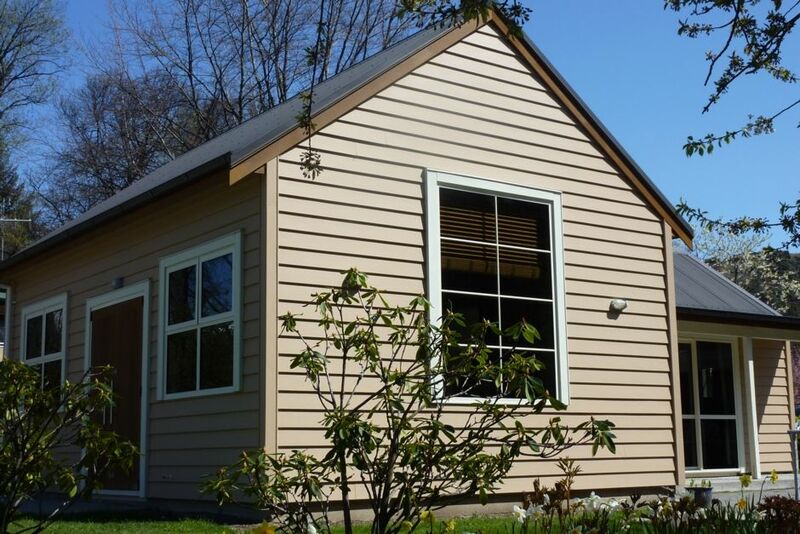 The cottage is well positioned in Arrowtown and it's only a short drive to Queenstown. The accommodation is very comfortable, clean and warm.